Rationalist Judaism: "Shall Your Brothers Come Into War, While You Remain Here?" "Shall Your Brothers Come Into War, While You Remain Here?" Earlier this week I wrote a post that used satire to criticize the charedi approach of claiming that yeshivah students provide protection while simultaneously pulling them out of areas that require protection. A number of people criticized that post, arguing that now is a time for unity, not criticism, and certainly not satire. Now, I do agree that in a time of national emergency, unity is required. Allow me, then, to explain why I consider my post to have been appropriate. As we know, the Bnei Yisrael were terrified of waging war to take possession of the Land of Israel. In this week's parashah, we are told about how the Bnei Gad and Bnei Reuven asked that they be allowed to remain on the east of the Jordan, and not to enter the Land of Israel. Moshe Rabbeinu gives his famous reply (32:6): "Shall your brothers come into war, while you remain here?" Would one ask why Moshe is sowing divisiveness at a time when unity is required? Of course not! First of all, his criticism was directly relevant to the matter at hand. Second, it was precisely the lack of unity that he was criticizing! 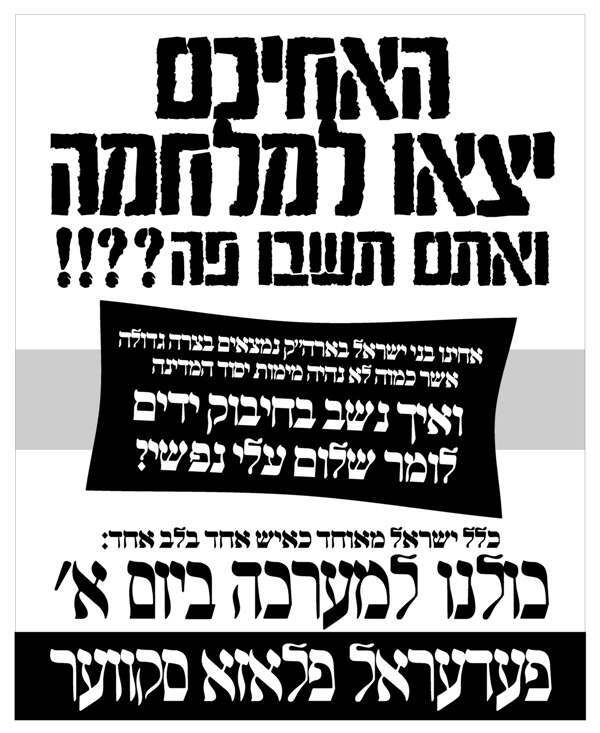 It was only a few months ago that hundreds of thousands of charedi (and a handful of misguided non-charedi) Jews rallied in Jerusalem and New York against the army draft being minimally applied to charedim with the same enforcement that is applied to non-charedim. They recited the prayer for Hashem to "pour out His wrath upon the nations" with regard to the Government of Israel. They expressed hakaras hatov to the NYPD but not to the IDF (a pattern that continues this week with the Agudah expressing its hakaras hatov to Obama for funding the military but not to the soldiers who are actually in the military). Many of us still haven't gotten over that. And right now, it is the IDF that is protecting the citizens of Eretz Yisrael from the thousands of rockets that Hamas is launching. Right now, there are tens of thousands of reservists being drafted to join the regular IDF forces in a possible land invasion of Gaza. Why is the charedi community not part of this? Why is it the non-charedi community that has to put themselves out, potentially putting their lives on the line? "Shall your brothers come into war, and you remain here?" Making things worse is that not only are they not serving in the army, not only do they not express hakaras hatov and concern for those who do serve in the army, not only do they curse those who try to make them join, but they are even weakening morale by evicting yeshivos from areas of the country that are in greater danger. And to add insult to injury, they claim that they are the ones providing the true protection! So, yes, I think that at this time, criticism is extremely appropriate. And it is not "inappropriately harming national unity" to criticize those who are harming national unity. (As for the satirical tool of referring to the "black dome", the idea was to take them at their word that they believe themselves to be providing essential protection, which serves to highlight the problem in their approach.) Davka now, when everyone can see the importance of the IDF and the sacrifices that are made by its soldiers, and when everyone can see the folly and hypocrisy of the claim that yeshivah students are providing protection via Torah study, we have an opportunity to impress Moshe Rabbeinu's message upon the charedi community. And amazing, isn't it, that at those prayer asifas, Israel and the IDF were called Amalek. Whose Amalek now? This war is being waged by Gd to convince charedim that the state of Israel is not Amalek. It takes a war to do that. Sorry, but that's just as stupid as asserting that the war is being waged by God because of the homosexuals in Tel Aviv. Both statements presume they are privy to God's thoughts. I have it on good authority that this war is being waged by God because He's upset that the Toronto Maple Leafs collapsed midseason and missed the playoffs again. Bnei Gad and Bnei Reuven: "No, no, you see, we're going to stay here so we can *learn* for you." Moshe Rabeinu: "Ohhh, why didn't you say so? That's totally fine. Better, even. We're cool." I truly believe this is why Charedi education de-emphasizes TaNaCH. The cognative dissonance would be too great. It's actually astounding how little emphasis there is in tanach, including Chumash, on learning for the sake of learning. What little there is always comes in the context of learning in order to know how to observe the mitzvot. And usually not even that. The difference is, that Moshe Rabeinu had the power and ability to draft them, therefore the consequences of him keeping quiet would have had direct negative affect i.e. less manpower in the army. You on the other hand will not change the facts on the ground by ranting, therefore keeping the unity at a time such as now would be the appropriate choice. What unity? You have Haredi MKs speaking in the Knesset about how this is all a punishment for closing Haredi summer camps! Which didn't even happen! Per rt: You on the other hand will not change the facts on the ground by ranting, therefore keeping the unity at a time such as now would be the appropriate choice. If you are so sure that RNS can't change the facts on the gound by ranting, what makes you think that the same ranting will have any effect on the unity you seek to preserve? If anything, the recent events have shown that it is dafka the tefilos and Torah studied that have given Am Yisroel its protection! How exactly has the IDF protected us by its warfare, when there are missiles raining down on us hourly, but 90 percent of them do no damage, in a glaringly miraculous way? Perhaps you haven't heard, but a group of people, both religious and non-religious people at the RAFAEL company were given wisdom and energy by G-d to develop the Iron Dome system to intercept their missiles and he also gave wisdonm and energy to a group of IDF soldiers, both religious and non-religious to operate it. Perhaps it would have been more appropriate to raise the issue in a nonsatirical format. I also think it's an subsidiary issue to whether to look at the individual vs.my subgroup vs. all of klal yisrael when making decisions in a jewish state context.. This is exactly what I was trying to say in my comment to the last post on this topic. Criticism will not weaken unity if done in a constructive and respectful way. Satire has its place. This is not it. Looking forward to more cogent, relevant, intellectually stimulating posts from Rabbi Slifkin. Appropriate?? Appropriate for what. RS wants to point out the obvious error of the Charaidi position and there is no more effective way than through satire - just look at the success of the Daily Show with Jon Stewart. Its success in creating creating people with the intellectual sophistication of a proboscis monkey? 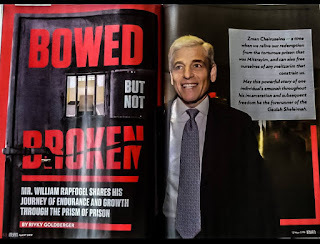 I mean lets be serious if Rabbi Slifkin is using Jon Stewert as his model then this blog may really have sunk to a new low. Fortunately, I do not think this is his intent, though I would appreciate more if he stuck to his general method of argumentation which relies of source analysis than this sort of shrill and fatous satirization. My reason for mentioning Jon Stewart was to provide evidence as to the effectiveness of satire not to compare RS to Jon Stewart (he is way to left). Jon Stewart has a very successful news show (on cable no less) at a time when all network news shows have diminished viewership. The main distinction he brings is his satiric approach to all news (including serious topics) and it gets people to watch and listen. Same thing here. The picture accompanying the piece was so effective (yamulka dome) he didn't even need to add any commentary - message received! Yes, if Rabbi Slifkin wants to attract viewers who wish to get a cheap thrill from satirical commentary, than by all means imitate the Jon Steweart model. If Rabbi Slifkin (as I believe to be the case) wants to attract thoughtful people interested in serious discussion, I think he would do best to avoid this type of post. "(a pattern that continues this week with the Agudah expressing its hakaras hatov to Obama for funding the military but not to the soldiers who are actually in the military)." I don't see that in Agudah's statement. It talks about funding the Iron Dome, not the military, which is true. It talks about close cooperation of US and Israeli military, also true. They thanked the military. Dec 30, 2008 --"...Hamas must bear full responsibility for the current loss of life in Gaza, in light of its direct complicity in encouraging, supporting, and carrying out acts of Islamist terror. No responsible government can be expected to refrain from action when its citizens face deadly rockets from across its border. Israel has every right and obligation to respond as it has, with the force it deems appropriate and necessary to fully eliminate the terrorist threat. That civilians in Gaza are being killed in spite of the efforts of Israel's citizen army to target only terrorists and combatants is the direct result of the cynical policy of Hamas to use its civilian population as a shield, hiding behind women and children, while placing and firing weapons of war in mosques, schools, universities, and apartment buildings. We commend the government of the United States for its unambiguous support of Israel's actions over the last few days. We congratulate the Bush administration for its recognition that responsibility for the violence lies entirely on the heads of the leaders, enablers, and supporters of Hamas and its allies. As with the pursuit of Al-Qaeda and its offshoots, terror must be met with resolve and force, as needed. We urge all governments and international bodies to ensure that Israel be given the time needed to complete its necessary military goals. Only in that way will the forces of terror and hatred in the Middle East and beyond be weakened to the point that more moderate elements will be able to pursue real peace between Israel and her neighbors." There is no thank you to the IDF in this one either. You omitted the beginning of the statement: "The Rabbinical Council of America fully supports the government of Israel in its campaign to stop heinous terrorist attacks directed for too long against Israeli civilians." An innocent omission? By the way, OU website posted prayer for IDF linked here: http://www.ou.org/life/israel/crisis-israel-can-help/ . No it was not an innocent omission. Bnei Gad and Bnei Reuven just liked the land they saw and wanted to stay there. Moshe Rabeinu was angry not because he did not have enough fighters but because he was afraid if Bnei Gad and Reuven stayed there they would discourage the rest of Jews to enter the land G-d gave them. The tribe of Levi was exempt from general military service. Levites were not counted in the census of the army because they had to perform spiritual work. Rabbi Slifkin, you should know better than to use the phrase "the bnei yisrael". Bnei yisrael has a built-in direct article. Sorry, I meant to sign that grammatical correction. Btw, once you are bringing it up. How many missiles were shot from Gaza? Close to 1500 how many of them were shot down by iron dome? about 250. What happened to the other 1250?? BLACK DOME ALERT. So if black dome is so much more effective than iron dome, why are so many people relying on iron dome to stay in the south, while charedim are not relying on black dome and running scared? If I am armed, and bandits approach which are equally armed, I would still flee. Does Black Dome protect better than Iron Dome or not as well? lets assume they protect equally, people are naturally afraid during wartime. Nobody will dispute that seatbelts protect. However, a wise driver will still drive carefully, avoid dangerous roads and avoid speeding. Does it mean he does not believe that seatbelts protect? You're missing the point. Charedim claim that their Torah is IN PLACE OF army service with regard to providing protection. If so, they should provide this protection where it is needed. You do realize iron dome doesnt intercept rockets that arent headed toward civilian areas. You just ask the same questions of us over and over, only each time slightly rephrased. The bottom line is that we do not see your state as our country. We do not identify with it and we will never let our boys shed their blood for the sake of your war against the arabs. But I suspect that you already know all this. So what exactly is the point of pretending that you don't? Wow, thanks for saying it straight! I wish people would be so straight under their real names. I'm afraid you're distorting the view of chreidim (actually the Talmud). The claim is NOT, that torah creates a mystical cloud of protection that cannot under any circumstance be penetrated. Rather, torah is a means of defense that is at least as effective as an army. So the same way you understand ,there is generally a loss of life during wartime, the same can be true here. Of course. And the same way that soldiers risk their lives to provide their protection for those who need it, charedim (who profess to believe that their Torah protects, and that this replaces their IDF service) should risk their lives to provide their protection for those who need it. Why should they risk their lives? What is the point? They can leave and learn Torah without the distraction of sirens and still provide protection. No, because the protection is concentrated in the place that they are. As long as the military remains there (without retreating) I agree. I didn't care for RNS's satire. I thought it was rather vindictive and invoked a nasty "I told you so" attitude. It's true that the principle of "Torah scholars don't need protection" has been abused and expanded beyond it's original application. Indeed, the sad sight of Yeshiva students fleeing the בית מדרש to safer ground does indicate that there are practical limits to how we apply the idea of "Torah scholars don't need protection". Halacha remains Halacha. The Mezuzah may provide protection, but it does not absolve the homeowner from putting up a מעקה. And a Torah Scholar who studies continuously still is חייב in the מצוה of מזוזה- no matter how many ספרים he has mastered. If "Torah scholar don't need protection" , why must they install a מזוזה? The Halacha is that במלחמת מצווה הכל יוצאין. Just because the Torah Scholar may not need protection doesn't mean he is absolved from Halacha. It all depends how dangerous it is. True, in certain circumstances the halacha requires one to leave. However, in a "non halachic" sakana, Rabbi slifkin might have a point (ignoring other reasons, like we are not part of the midina) that perhaps torah scholars should remain to protect. Shlomo, above, beat me to my exact thought. While you (Rabbi Slifkin) wrote "not only do they not express hakaras hatov and concern for those who do serve in the army", the statement indeed does state "Our prayers should include entreaties for the wellbeing of ... those who are risking their lives to defend..." Despite this criticism, I believe Rabbi Slifkin is generally correct. A little tweaking of that sentence and I probably wouldn't kvetch about it. You don't get it. This a statement for public scrutiny, and yet even so they only say that one should pray for the wellbeing of soldiers along with everyone else. The charedi Gedolim will never instruct their followers to say a prayer specifically for the wellbeing of the soldiers, even when the soldiers are particularly at risk such as now when they are entering Gaza. As far as I can tell, those were the words of the headline writer, not a quote from Maranan v'Rabanan. It may not be a direct quote but it conveys the general message of the gedolim (to the chareidi tzibur) to pray specifically for the soldiers, directly contradicting Rabbi Slifkins statement. Modern Orthodox Zionists are also learning for the soldiers. It's an initiative. There has been a shift in the last month. We should not ignore it or belittle it. Let's wait and see what impact all this has.